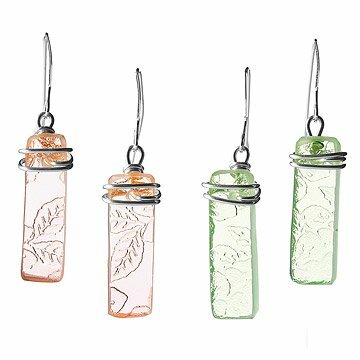 These earrings are made from reclaimed vintage dishware from the '30s and '40s, known as Depression Glass. Reclaimed from the broken remains of a vintage cake plate (pink) and saucers, plates, tumblers and cookie jars (yellow), this delicate and lovely glass was made in great quantities during the 1930s and 40s, and is now known as Depression glass. A beautiful link to the past, the glass is salvaged from the Pennsylvania Amish Country in an effort to help the environment and protect wildlife by removing this hazard. Each piece still maintains the original embossed Cherry blossom pattern and is finished with sterling silver wire. Handmade in Pennsylvania by artist Laura Bergman. An avid antique glass and bottle collector, artist Laura Bergman lives near a wooded area with multiple antique bottle dumps. "It always bothered me how, as a collector, we take away the pretty whole bottles, but leave the broken pieces behind," she says. After seeing a baby fawn laying among these pieces one day, and having had one of her dogs return from a walk with his feet cut, she decided to pick up the pieces of this lovely antique glass and use them to create jewelry and gifts. Each of her pieces is handmade from 100% reclaimed antique glass from these dumps. Being a bottle collector for many years, Laura has researched and collected the history behind each type of glass. Each piece truly is "A Little Piece of History for You to Wear". Glass can be washed with soap and water, sterling can be cleaned with any sterling cleaner. They are beautiful and very unique. I love them. These are so unique! Understanding how the earrings were created is wonderful; I've had individuals young enough to be my (gulp!) grandchildren say they like them. Wow. The earrings are great but the etching is not as clear as pictured. I may send them back for the green glass. My mother collects depression glass. This was the perfect gift. I bought this as a birthday gift for my wife and got some serious brownie points as a result! The fact that there is so much history behind this makes it special. Such a pretty pair of earrings. I love the fact that something new was created from something old. They were a gift, but I liked them enough that I wished they were for me. These earrings were a gift for someone who loves dangle earrings, depression glass and the color green. She likes them. A piece of history becomes jewelry. My Grandmother had the pink Depression Glass dishes for every day use. I've always loved the dishes and now I have earrings that bring a bit of history into the 21st century. These were a gift for a friend and she said she loves them, unique and comfortable. She loves green. These are very pretty and delicate earrings. A bit shorter than I was anticipating, but that adds to their delicacy.